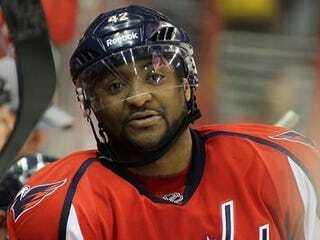 Francie Latour tackles the racist attacks on NHL player Joel Ward at her Hyphenated Life blog. She says that Ward's Jackie Robinson-like stoicism should serve as a lesson for us all. I know absolutely nothing about the game of ice hockey, and even less about the National Hockey League. But I learned two important things about this sport in the past week: I want to be more like Joel Ward, and America needs to be more like the Boston Bruins. Ward, we all know by now, is the Washington Capitals forward who bested Bruins goalie Tim Thomas with a rebound shot in overtime and, with a flick of his wrist, dethroned the hometown Stanley Cup Champions. As we also all know by now, Ward is one of a very few black players in the game, a Canadian citizen born of Barbadian parents. Warning to Joel Ward. Your one of three black guys in Canada. I will find you . . . and I will kill you. Read Francie Latour's entire blog entry at the Hyphenated Life.